If Geno Smith wasn’t on national television he might have thrown a tantrum. Slipping in a very Aaron Rodgers-like fashion, Geno Smith did not handle what was in store for him in a very Aaron Rodgers-like manner though. Geno pouted, his head was slumped down as he texted and he eventually left early, too rattled to endure a few extra minutes of pain. There were even reports that Geno Smith wasn’t going to stay in New York for the 2nd round, which garnered a lot of bad publicity. So Geno Smith stayed, saying he never intended to leave. His response to finally being drafted. Well, that wasn’t anything to be proud of either. Geno Smith told you everything you need to know about Geno Smith the person without saying a word and, when he did speak out loud, it didn’t help anyone change their mind. It is always dangerous to read too much into these types of things. For such a young person to have the most exciting day of their life turn into the most depressing day of their life documented in front of the world cannot be easy to deal with. Nevertheless, this isn’t a good sign for the New York Jets, who have now officially wasted the past 4 seasons on Mark Sanchez. They could be wasting another 4 on Geno Smith. Geno Smith already has tons of question marks surrounding his ability to be a franchise NFL quarterback. Duh, he went 39th overall. All those question marks have been dissected to the Nth degree. There have also been mixed reports regarding his possible lack of character, most notably from Nolan Nawrocki of Pro Football Weekly. I wasn’t sure what to make of Nolan Nawrocki’s report before the draft. Now, I have to say that I am buying whatever Nolan was saying. To be a great NFL quarterback, having it figured out between the ears is a must. More so than any other position in sports. Ryan Leaf, Vince Young, Jamarcus Russell. None of them had it. Geno Smith does not strike anyone as the brightest bulb in the janitor’s closet. He was unable to replicate a simple white board play with NFL Network’s Steve Mariucci. Andrew Luck and Robert Griffin III breezed through the white board test during last year’s NFL Network special. People don’t rave about Smith’s intelligence like they did with all 3 of last year’s rookie sensations. Not being smart does not make Geno Smith a bad quarterback. Dan Marino has shown that you can be great without having too much going on up in the ol’ noggin. It certainly doesn’t help though. 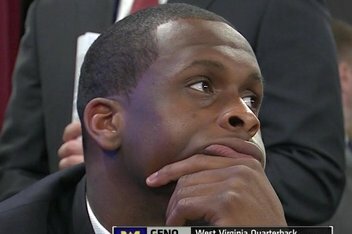 More importantly, it is the way Geno Smith reacted at the draft. What he did was confirm all these character questions surrounding him. To react in such a childish manner demonstrates a lack of intelligence, character and an inability to handle adversity. Geno Smith thought it wasn’t fair that he did not get his cookie and he didn’t care who knew that he was upset. He had to have known it was a realistic possibility that he would drop out of the 1st round altogether. Did no one give him a draft history lesson? You think that was tough Geno? Wait until the New York media gets a hold of you. Geno Smith has mentioned how the critics have been motivating him, that the chip on his shoulder is getting bigger and how he wants to prove all the doubters wrong. I guess those things were a lot easier to say when he thought he wouldn’t drop outside the top 10 because, by responding the way he did to the situation, the critics are all refueled and ready to pour more onto the fire. Instead of showing everyone how mature he could be in handling a very difficult situation, Geno Smith melted. He said that “I think it was just a test of patience, a test of character,” and that “I wanted to make it my duty to come back today and still represent for my family and all of those that support me.” If this was a test, he failed big time. Furthermore, he should not have had to explain why he decided to attend the 2nd day of the draft. It should have been common sense. It isn’t fair to compare Geno Smith to a guy like Aaron Rodgers. Aaron Rodgers is a rock. Nothing bothers the guy. He handled the Brett Favre debacle as well as any sane person could. The thing is, that’s the type of character I want in my quarterback. I don’t want the guy who knows that all eyes are on him but still can’t turn his frown upside down when Roger Goodell wants to go in for one of those ridiculous bear hugs. Geno Smith is entitled to be unhappy but a person in his circumstances puts a mask on That’s just what you do. The fact that he wasn’t able to do that says something about the guy and it isn’t anything good. If any other team was thinking of taking Geno Smith, he must have made them feel pretty good about their decision to pass on him. The New York Jets got some pretty good value out of a guy some felt would be snapped up as early as 6th overall. An incredibly physically gifted quarterback, Geno Smith is going to bring a lot of buzz, as there always is, to the city of New York. The past is the past. It’s time for these young men to get to work. But the way the past 36 hours unfolded for Geno Smith, all I can say is, thank God he isn’t on my team. Also, you can follow me on twitter @chrisrossPTB and I will happily return the favour. Like the great Roman and Greek civilizations, the National Football League’s demise has officially begun. America’s 365 day a year pass time took a big blow right in the gut today. After a 31-1 vote, the NFL’s passed the ‘Helmet Rule’, which penalizes a player who makes or initiates contact with the crown of his helmet outside of the tackle box. The NFL has made a big statement with this rule change in regards to the health of its current and future players. However, the NFL made another statement that just might not be one that anyone can foresee right now: The NFL will cease to exist in 50 years. But before you do, think about it. The NFL is currently at its pinnacle with regards to not only its own history, but in the context of professional sports history as a whole. In terms of advertising, television viewers and gross revenue in general, the NFL is second to none. 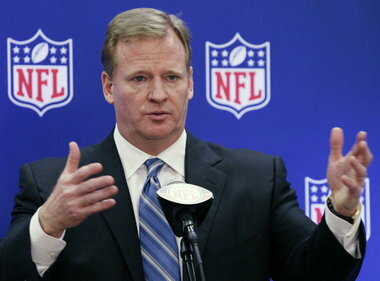 To put it simply, the NFL has become the ultimate money-making machine. The game is changing though. Due to the enormous amount of law suits that have been piling in from former NFL players, Roger Goodell has been forced to act. Head shots have been taking out of the game, and rightfully so. Quarterbacks are treated like royalty, and rightfully so. The NFL is going too far though. Even though Mike Florio of NBC’s Pro Football Talk has pointed out that the new helmet rule is more limited than it is widely believed to be, this is a classic sign of the beginning of the end. The NFL moved kickoffs up to the 35 yard line last year, which has partially removed the kick return from the game. The next logical step would be to eliminate the kickoff altogether. Well, doesn’t that sound fantastic? It won’t be long before the NFL removes what can be the most exciting play in any given game. A play that has the potential for fireworks every time it isn’t kicked out of the end zone. I’m looking at you Jacoby Jones. Although former players will always have a biased view, not much different than the elderly man at the bus stop who yearns for the way things were back in his day, they correctly understand the game is leaning too much in the direction of safety. They know what the risks are, and they accept them. Current players make the same conscious decision. As callous as it may sound, those are the cold hard facts. Professional football is not a bubble-wrapped world. The NFL has been able to create this empire in large part due to the violent nature of the game. The NFL is the first world version of the Roman Gladiator’s. The greatest physical specimens are placed in a confined arena where the ultimate goal is to smash their opponent into oblivion while each armed like Iron Man light. And we love it. Maybe it’s just me, but the rugby shoulder tackle isn’t quite as exciting. It’s probably not the first time you have heard this, but the game is slowly but surely turning into a game of flag football. While flag football may be a lot of fun to play, I imagine it’s not as good on TV, even if it is in high def. Little does the NFL know that this gradual transition is putting the league towards its inevitable termination. These changes do not just have ramifications on the way the game is going to be played in the future for professionals either. Every rule change affects how the game is being viewed by parents looking to put their kids into sports at a young age. From 2009-2011, the number of kids who play tackle football was down 15 percent. Although it could be viewed as a good thing that the game will be safer to kids, a lot of parents might simply be saying, why risk it? If all these rule changes are necessary for the game to be safer, what does that say to a parent who has the choice between soccer, baseball, basketball and football for their child? There has already been a drastic decrease in youth participation in football across the United States. To believe that these rule changes will work to increase those numbers is a very utopian outlook on the situation. Despite the rule changes, the risk will always be there as long as players are armed with the equipment that they have. Most parents will understand that. With the ever-expanding body of medical evidence outlining the damaging effects playing football can have on an individual later in life, the NFL will be forced to make the game even safer as time goes on. That, or face an enormous amount of law suits. Tackle football, with helmets and pads, is an extremely dangerous game. The way to change that involves compromising the very thing that makes the game appealing to so many fans. The NFL is succeeding at both. The seemingly natural evolution, or de-evolution, of the rule changes that have transpired over the past few years would be to continue down this safety road. The NFL reached its peak of violence and, not coincidentally, its peak in revenue and viewership. As the decline in violence continues, so will its decline as the league all other leagues aspire to be. Before we know it, the game will have turned into something almost unrecognizable. Again, this won’t be an immediate transformation. It will be a snail’s pace change that will face serious opposition from a multitude of outlets. But 50 years from now, the NFL as we currently know and love, in all its concussion-filled glory, will be no more. Also, you can follow me on twitter @paintstheblack and I will happily return the favour. To believe anything that a prominent public figure says these days would be naive. Charlie Brown believing that Lucy won’t pull the football away when he tries to kick it naive. For some reason though, I think we all wanted to believe Bill O’Brien when he stated that he was “committed for the long term to Penn State.” After what was possibly the most tragic scandal in sports history, Bill O’Brien was promising something more than winning football games to not only the men at Penn State but every loyal supporter of the program in Happy Valley. 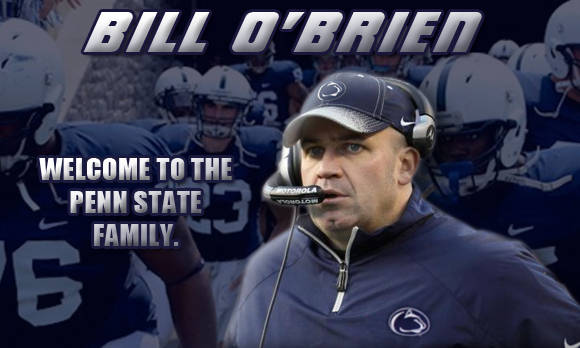 Hope is exactly what Bill O’Brien gave Penn State this year. He walked into a situation worse than what anyone could have had nightmares about and made the Nittany Lions respectable again. Respectable wasn’t expected right away but Bill O’Brien somehow managed to do it. He promised hope and he delivered. At least for one year he did. However, it shouldn’t come as a surprise that Bill O’Brien is now rumoured to be considering interviews for the many vacant NFL head coaching positions following the dreaded Black Monday. Even though this shouldn’t be a surprise, I think we all expected more out of Bill O’Brien. Given the circumstances, it wouldn’t be fair to the young men that he promised hope to and it wouldn’t be fair to everyone who thought Bill O’Brien was being genuine when he said he was completely on board to reviving Penn State football. Bill O’Brien has shown us that he is no different than most any other high level professional head coach in North America. All of these head coaches preach commitment, brotherhood and loyalty. They expect the players to buy into these things that they preach but in the end it is all just garbage they spew out for their selfish gains. Their ultimate goal is not to help mold teenagers into young men or fight the good fight with their players as if they were brothers. It is simply a means of furthering themselves in the cutthroat world of professional coaching. It is more of a do as I say, not as I do kind of thing. Get the players to buy in. That’s all that really matters. Bill O’Brien said what he said because he knew he had to. There was no other way he was going to convince the current players at Penn State not to jump ship. But to look those young men in the eye and tell them that he was going to be in it for the long haul with them is plain old disgusting. This was a disaster for the ages and Bill O’Brien is choosing to ignore the unique situation in favour of me, myself and I. Whether he decides to interview for an NFL job or not is irrelevant. The fact that it has gone public that he is even considering it is enough to prove that he is no different than any other selfish professional head coach. You know, the ones who portray themselves to be family men but in actuality spend 18 hours a day working, never seeing their wife or kids. What about the college coaches that tell their superstar player they would be better served staying the extra year in school (I’m looking at you Pete Carroll). I should have learned by now that the circumstances of their program or team is not important. Coaches will say whatever it takes to get ahead in the game. They can’t practice what they preach because so much of what comes out of their mouths is a bunch of blinkin’ fertilizer. A coaches supposed steadfast commitment to their current team and players is about as trustworthy as the National Enquirer. If someone in Bill O’Brien’s shoes is willing to say he is in it for the “long term” and that he would do everything in his power to “help guide the University forward to become a national leader in ethics, compliance and operational excellence” then pretty much everything is fair game. Bill O’Brien has every right to explore his options as an NFL coach but it’s not as if those opportunities won’t be there down the line for him. Is Lane Kiffin really that much worse than any of these other guys? Lane Kiffin doesn’t give a damn about anyone except for himself but he is just not as subtle about his overt selfishness. Really, none these coaches give a damn about anyone else. So the next time you hear a coach speaking about dedication, loyalty and commitment, call it out for what it is. It is official. Tony Romo is the ultimate tease. He has the entire package, plays for the flashiest of flashy teams yet falls short of sealing the deal. For his entire career, Tony Romo has dealt with the same old, same old – he can’t perform in the clutch. For a long time, a lot of the criticism that went Romo’s way seemed a bit too much. What is always hard for Romo is that because he dates Jessica Simpson, plays for Jerry Jones and likes to smile, people want him to fail. Whether it is justified or not, like Lebron James in his first two seasons with Miami, fans and analysts will nitpick at anything they can find for a player they may dislike. 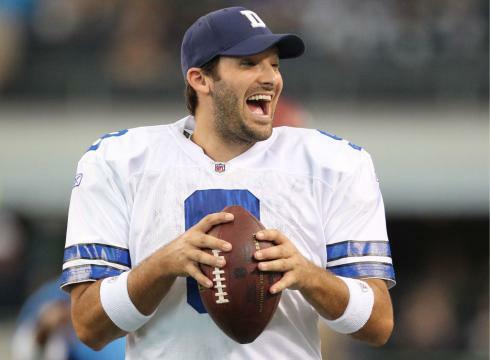 Unlike Lebron, the disdain people have for Tony Romo the man, not the player, feels unjustified. It is not easy being a Romo defender. I know because I’ve been doing it for quite a while now. As hot as he can get, his play will make you shiver more often than it should. I wouldn’t go as far to say that Tony Romo has the choke gene. Rather, it is more that he doesn’t have the clutch gene. Too frequently is the term clutch or choke thrust on a player. Most guys are probably somewhere in the middle while the odds of their big game circumstances have simply gone either in their favour or against them, prompting them to be labelled clutch or a choker. Over the last two December’s, prior to last night’s game against the Redskins, Tony Romo had thrown 20 touchdowns and only 2 interceptions. A choker doesn’t have the ability to bring his team from the depths of despair in big moments as often as Romo has. Even though his January record is virtually non-existent, he hasn’t faltered in some of the tougher situations throughout his career. The thing is, it is as if it is in Romo’s DNA to make huge mistakes at huge moments. Tony Romo had another John Elway type of opportunity on Sunday night with all eyes on him. Down 3 points, on his own 15 yard line, 3 minutes to go and a touchdown likely being enough put his team into the playoffs. Anyone can muff a hold on a field goal or throw a costly interception. But Tony Romo is a quarterback who, time after time, has let his team down with the kind of blunder that it is almost fitting for number 9. That isn’t to say that Tony Romo can’t win a few playoff games or have one of those career defining drives in a championship game. If Romo ever does have a career defining drive, play or game, that moment should never be something that transforms his imperfect legacy into something that it does not deserve to be. To a lesser degree, Peyton Manning lacks ‘it’. He doesn’t have what his brother has proven to have. Peyton won a Super Bowl MVP but it wasn’t a stellar performance by any means. Peyton Manning has become arguably the greatest quarterback of his generation not through his ability to be his best when everything is on the line but through his immense talent and smarts. Tony Romo doesn’t have Peyton’s talent or smarts. Nevertheless, he can and has come up big in big situations because he has the elite talent that allows him to do spectacular things. However, he isn’t so good that he doesn’t suffer from a recurring case of major gaffe-itis. Romo made the poorest of poor reads to give Rob Jackson a season killing interception. Despite the timing of the miscalculated floater, the interception wasn’t due to Tony Romo’s choking. That play was a microcosm of his career as Romo is a player who doesn’t have the capability to consistently step up when the stakes are highest. It isn’t choke or clutch. It is who Tony Romo is. Lebron James overcame his perceived choking propensity last season. There is nothing to say that Tony Romo can’t do the same. What will never change with Tony Romo is that he doesn’t have what every athlete wished they had or chooses to believe they have. Agree? Disagree? E-mail me at cross_can15@hotmail.com or reply in the comments section below. The script had everything that a person could want — intrigue, drama, and a flawed main character. It was a Broadway show that had the makings of being a huge money-maker but the director decided to go another route. Tim Tebow was supposed to be the next big thing in New York but he didn’t even get the chance to be a flop. 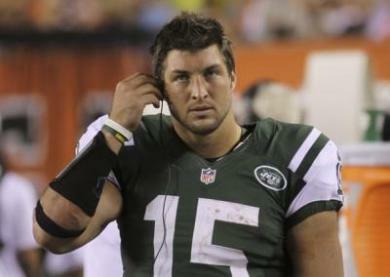 It was reported earlier today that the New York Jets are ready to part ways with Tim Tebow. Despite all the expectations heading into the season and the plethora of ESPN coverage, Tebow’s tenure in the Big Apple was just rotten. Following the Mark Sanchez benching this week, Tim Tebow was bypassed as starting quarterback for 3rd stringer Greg McElroy. It was the last straw for Tebow and ultimately signalled the end for the former Heisman Trophy winner. Unfortunately for Tebow and ESPN, this failure with the Jets might have signalled more than just the end of Tebow’s days in New York. The director, Rex Ryan, obviously wasn’t comfortable with Tim Tebow having a starring role in his play. This special Tebow package that Tony Sparano designed for Tebow has yet to be found and I don’t think anyone is sure if it actually exists. The coaching staff refused to insert more Tebow into the offence despite Mark Sanchez’s consistently abysmal play. It speaks volumes to what the coaching staff thinks of Tebow. The clock never struck Tebow time in New York and it appears as though the clock is ticking rather quickly on Tim Tebow’s opportunity to be one of the NFL’s 32 starting quarterbacks. Although he was such a success in Denver, it appears pretty clear that Tim Tebow will never be more than a novelty in the NFL. A ploy that owners use to increase jersey sales and media hype for their team. No one, except maybe Josh McDaniels, believes that Tim Tebow can be the long-term solution for their franchise. The New York Jets had an entire season with Tim Tebow. They saw him workout, practice and play. Well, sort of play. Out of any team in the NFL, the Jets coaching staff knows Tim Tebow better than anyone else does at this point in his career. Regardless of their immense struggles, they still didn’t believe it was worth putting him under center. They felt it would be better if Tim Tebow didn’t get a sniff at leading their Sanchize. They knew that Tebow time can lead to short-term success. However, the possibility of short-term success would undoubtedly lead to long-term problems. The potential limited success of Tim Tebow wasn’t worth the pain of having to find a real quarterback somewhere down the road. Let’s be real, that would be an inevitability. I mean, it has been 3 seasons and Tim Tebow still throws while rolling out to his right about as well as I can cook, which is not very well if you couldn’t guess. To commit to Tim Tebow means committing to a completely different style of game. It means tailoring personnel to fit his very unique brand of football. It means going all-in on a system that has absolutely no guarantee of working. After watching the Tebow experiment fizzle out in New York, teams are seeing that Mr. John 3:16 is more headache than help. Any ownership or management group that is more concerned with winning than merchandise sales won’t be willing to roll the dice on Tim Tebow. For a project as defective as Tebow, who wants to take the risk? Everyone is learning what John Elway knew all along. I can’t even imagine that Shahid Khan is considering Tebow as a viable starting quarterback option at this point. Tim Tebow did not get the big break he was hoping for after he was dealt to the New York Jets. All he has left to do now is to hope that someone else sees what Josh McDaniels saw at the 2010 NFL draft. The thing is, that ticking clock, it’s already close to zero.